Gorgeous vintage look matched with a solid build and a lovely tone. More dynamic pickups would be nice. uring the time I was reviewing this guitar, I had no less than 3 people mistake it for an american made ’52 reissue. Sure there are differences, but you have to admit, it is an easy mistake. From the vintage logo to the stunning ash body, it does bear more than a passing resemblance to it’s more expensive cousin. FSR stands for “Fender Special Release” or “Fender Special Run” depending who you ask, and our enquiries tell us that this model is a limited edition run, most likely only available when there is some surplus ash to be shared around at Fender. But it’s not just the ash body that separates it from it’s other Mexican made friends, the FSR also has vintage noiseless pickups, vintage brass saddles and a reversed control plate (more on that later). 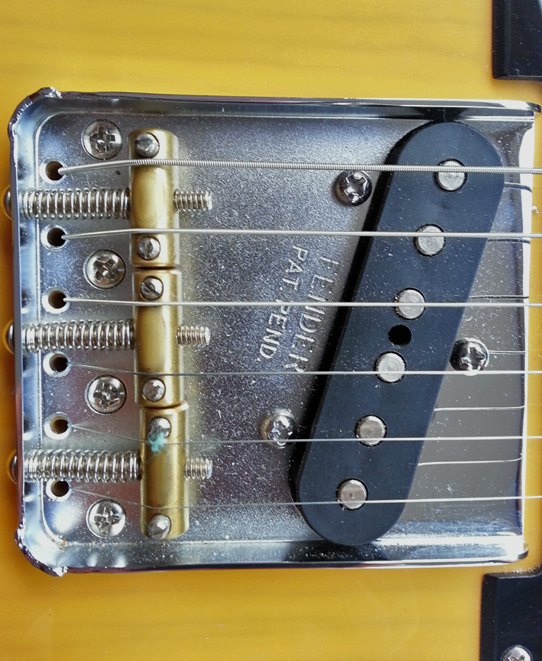 The vintage noiseless pickups actually are true to their name and are pretty noiseless. Not so noiseless as some well shielded humbuckers, but far less noisy than the standard pickups you would normally find on a Mexican made Telecaster or other similarly priced single coil guitars. This is a definite plus on this Telecaster. 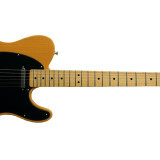 The bridge also delivers that “twangy” goodness that many players love in a Telecaster. You’ll be surprised just how much bite and aggression you can get out of the bridge pickup on a Telecaster. Throw in some distortion and it you can cover basically every genre. 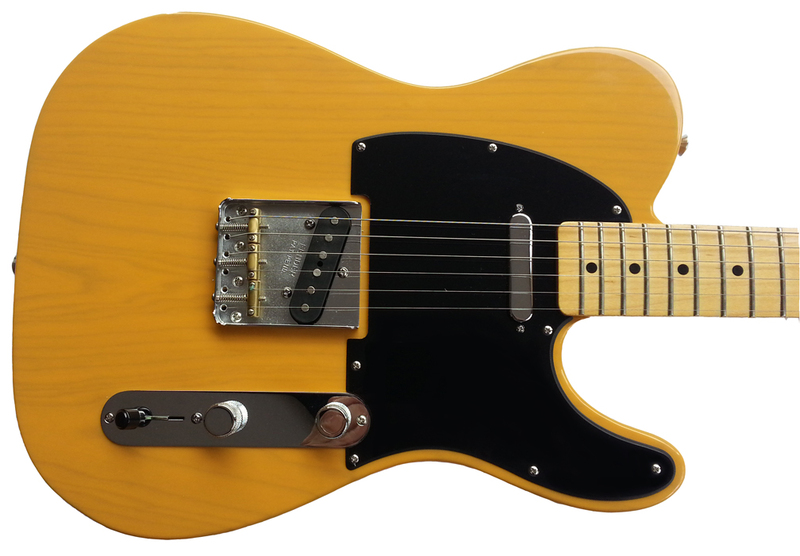 One tone that is less often talked about on Telecasters is the middle position, which combines both pickups. I found that it gave gave a really good funk tone, and brings the best of both worlds together (which I guess is what you’d expect, but it’s really obvious to me on a Tele). The neck pickup somehow gives you that buttery tone, yet still delivers it with some clarity. I found this tone to be my favourite this guitar, and I’m not the first (nor will I be the last) to place the neck pickup tone on a Tele as among my most preferred.If I had minor complaint about these pickups, its that they are perhaps a little less dynamic than the more expensive Fender single coil pickups, but to some they may be preferable. For the price, I think they are spot on. This little feature is maybe harder to spot unless you’re familiar with Telecasters. If you compare the control layout to a regular Telecaster, you’ll notice that the whole plate has been turned around so that the volume control is directly below the player’s hand, rather than the pickup switch. The benefit to this change is that things like volume swells are easier to execute if the volume control is closer to your fingers, and the downside is that the pickup switch is further away. So if you’re the sort of player who regularly switches pickups during songs, then this may be an annoyance. Of course, there’s nothing stopping you from turning the control plate around to be back to the regular configuration, but it’s probably best to have this done by a qualified technician, as some re-wiring will be required. Turning this control plate around is actually nothing new. It’s a popular mod among Telecaster owners, which means there’s a lot of material available on how to do this (or how to undo it). Ash is known for its tone wood properties, as well as it’s attractive grain. At first glance with the model I tested, I really thought this was a single piece of wood, but the join is just so well hidden, it’s actually a 2 piece (single piece bodies are almost unheard of, even on custom models). As far as colour and finish go, the butterscotch is so classic, it’s hard go past. Butterscotch is to a Telecaster what red is to a Ferrari. Due to the limited availability of the FSR range, it’s actually difficult to outline all the colours and options available. Google search results often end in dead links as stores sell out quickly. 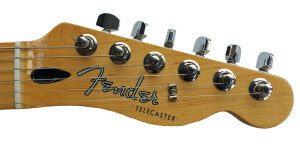 Product pages on the Fender site change rapidly. I’ve seen other variants before, I’m sure…if anyone has a link to a FSR variant other than this butterscotch model, pop it in the comments, I’d like to see more. There’s probably no need to discuss design in this review. The Telecaster is a model in great design, simple, strong, expressive…best summed up by Jim Weider, who famously said “If you don’t have a Telecaster and you don’t have a toothbrush – you’re in trouble.” Enough said. Design aside, the build quality on the FSR Telecaster is first rate. The volume and tone controls are probably the most solid, least slip you will ever play. The heavily gnarled finish means there is no way your finger is slipping off this thing. It another tactile reminder of the sturdiness of this guitar, which simply just feels so solid in your hands. It’s like you could start a song, stop to use it as an axe to chop up some wood, then continue the song without going out of tune. Even the simple 1-ply black pick guard is solid and re-assuring…I don’t know what it is about Telecasters, I get so carried away with simplest things! The “modern C” shaped neck is neither thin nor thick, I would say it is a comfortable handful. This model has a maple fretboard, that is there is no separate piece of wood for the fretboard, it’s just a single piece of maple for the neck. This is my favourite setup on a Tele, I find that visually it looks great and the tone tends to be a little brighter. The result is a really comfortable neck shape, and it plays beautifully. Medium jumbo frets are pretty common these days (see my post on these if you’re not sure what this means) and suit the neck and scale length great. This is a very very easy guitar to play. 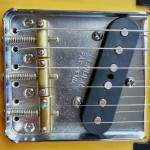 The bridge is the classic “ashtray” Telecaster bridge, responsible for much of that brash tone. It also features vintage styled brass saddles, so there isn’t a separate saddle per string, but rather each saddle holds two adjacent strings. I haven’t had any issue with these sorts of saddles when it comes to string height adjustment or intonation. There may be some issues with cheaper saddles, but the FSR sets up easily and it just never goes out of tune. Honestly, you can play this guitar, leave it for a month and it will require only the slightest of adjustments to get back in tune, brilliant. The strings are through the body, so the bridge look is very neat. There are other minor vintage features on the FSR Telecaster, such as the cup jack plate and the vintage logo on the head stock (which actually looks really cool). As far as high tech wizardry and gadgets are concerned…you’re looking in the wrong place. A Telecaster is the workhorse of the guitar world, it doesn’t rely on tricks or gimics, it’s the result of a man’s vision for simplicity and efficiency. Considering the moderate price that you can get these guitars for (if you can find them), they make a lot of sense whichever way you look at it. You’ll love the solid feel, versatile tone and smooth playability…but most of all, I think you’ll love the simplicity.